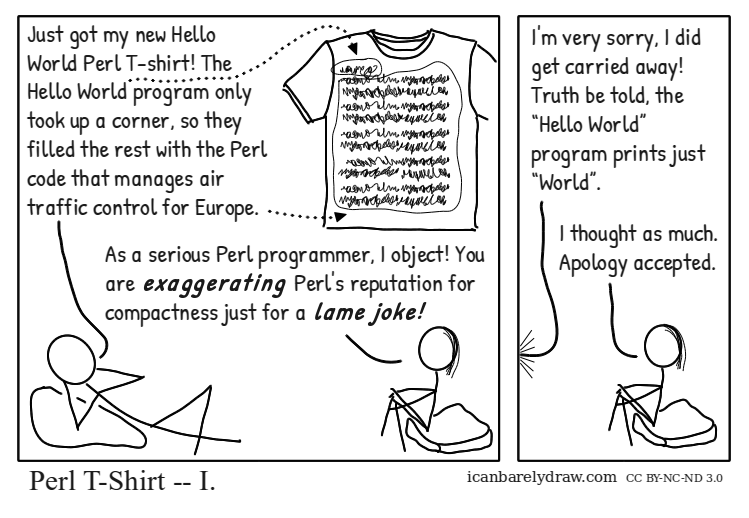 Man: Just got my new Hello World Perl T-shirt! The Hello World program only took up a corner, so they filled the rest with the Perl code that manages air traffic control for Europe. Woman: As a serious Perl programmer, I object! You are exaggerating Perl's reputation for compactness just for a lame joke! Man: I'm very sorry, I did get carried away! Truth be told, the “Hello World” program prints just “World”. Woman: I thought as much. Apology accepted. Title: Perl T-Shirt -- I.